6 Who is obligated to count? The bracha to be recited before counting the Omer is ברוך אתה ה' אלוקינו מלך העולם אשר קדשנו במצותיו וצונו על ספירת העומר - Baruch Atta Hashem Elokeinu Melech HaOlam Asher Kideshanu BeMitzvotav VeTzivanu Al Sefirat HaOmer. One should say the Sefirat HaOmer standing up. If one said it sitting, one fulfilled one's obligation after the fact. There is a dispute if a person can fulfill Sefirat HaOmer by listening to someone else count. Therefore, one should avoid doing so. However, one may fulfill the bracha by listening to someone else count. If a person wrote in a letter that today was such-and-such in the Omer there is a dispute if one has fulfilled one's obligation and therefore, one should count again without a bracha. If one forgot to count at night one can still count during the day without a bracha and continue to count the next night with a bracha. Sephardim have a minhag to count the sefirat haomer after Shacharit every day so that in case someone forgot they will have fixed it. Ashkenazim don't have that minhag. If one forgot to count one entire day and night, some say that one can be the Shaliach Tzibbur and make the bracha for others, however, others argue that one may not do so, rather once one missed a night and day, one may not count with a bracha but one may listen to someone making the bracha for himself. If it's before Shekiah then one may answer the day in the Omer in a straightforward manner and still say that night's Omer with a Bracha. However, because of a minority opinion that one fulfills one's obligation by counting after Plag Mincha, even before Shekiyah, one should be careful not to answer in a straightforward manner but rather say "yesterday was such and such". From a half hour before the time for sefira (according to some poskim, this refers to sunset, while others maintain that it refers to Tzet Hakochavim), one shouldn’t eat a meal until he counts sefira. More than a KeBaytzah of bread is considered a meal, however, even a lot of fruit isn’t a meal. There is a dispute whether Pas HaBah Bekisnin is considered like bread for this halacha. Nonetheless, many poskim defend the minhag to eat before sefira if one regularly attends a later minyan. Who is obligated to count? According to R. Ovadiah Yosef, a child who became Bar Mitzvahed during Sefirah should continue counting after his Bar Mitvah without a bracha. However, most Ashkenazi poskim say that he may continue counting even with a bracha. A convert who converted during Sefirah should count without a bracha from the time of his conversion. After ten days one should count the ones digit and then the tens digit such as Echad Asar and Eched V'esrim. If one switched the order one fulfilled his obligation. If it is normal in your country to say the tens digit first you should say it before the ones digit as in Esrim V'echad. The minhag is for the first ten days of the Omer to use the term Yamim to count the days but after the tenth day the minhag is to uses the term Yom for the days part of the counting as in Eched Asar Yom and not Yamim. If one made the bracha and counted incorrectly and didn't fix it within a Toch Kdei Dibbur one needs to count again with a new bracha. A fourth minhag followed by some is to observe sefira, in regards to not cutting one's hair, for the entire duration of the sefira from Erev Pesach until Erev Shavuot. If one is invited to a wedding which takes place during a time of the sefira when one's custom is to observe the practices of mourning, and the one who is getting married has the custom that it is permissible to get married then, one should not refrain from going to the wedding because of the sefira. However, one may still not shave in such a situation. It is permissible to celebrate a bar mitzva with dancing during sefira, but without music. In commemoration of the death of the students of Rabbi Akiva, the minhag is not to cut one’s hair during sefira. Although many minhagim exist, the common minhag is that Sephardim don’t cut their hair until the 34th day of sefira in the morning and Ashkenazim don’t cut their hair until the 33rd in the morning. According to Ashkenazim, if there's a pressing need women may cut their hair during Sefirat HaOmer. According to Sephardim, women may cut their hair during the Sefirah. Many Sephardic authorities are lenient regarding shave on Rosh Chodesh Iyar if it causes one pain not to shave, however, Ashekanzic authorities seem not to accept such a leniency. Many authorities hold that one may not shave on Friday for Kavod Shabbat, though some allow it. If there is a great need the Sephardic poskim are lenient to allow shaving every Friday. ↑ Rambam (Sefer HaMitzvah Mitzvot Aseh #161) counts this as one mitzvah to count days and weeks and not as two separate mitzvot, seemingly based on the gemara menachot 66a. See Tosfot Menachot 65b s.v. Ketuv who asks why we only count 49 days when the Pasuk says to count 50 days and answers that the pasuk doesn't mean from the Korban Omer until the day after HaShabbat HaShevit count 50 days but rather means to from the Korban Omer until the day after Hashabbat HaShevit which is the 50th day one should count (up to but not including). Alternatively Tosfot answers that the command to count to the number 50 in the pasuk refers to when the Korban Shtei HaLechem is brought and not the count of the Omer. ↑ Rosh (Pesachim 10:41) and Rambam (Temidin UMusafin 7:23) write that Sefirat HaOmer should be said standing. S”A 489:1 codifies this halacha that one should say Sefirat HaOmer while standing. The Rambam adds that, if one did say it while seated one fulfills one's obligation after the fact. The Mishna Brurah 489:6 concurs. Mishna Brurah adds that one should stand also for the bracha. ↑ There is a major dispute amongst the Rishonim if Shomea KeOneh is operable by Sefirat HaOmer. The Ramban (Pesachim 7a s.v. VeAni) implies that you can't Sefirat HaOmer with Shomea KeOneh, since in theory we should have said the bracha with a lamed as it can't be fulfilled by someone else. Rashi (Menachot 65b) also seems to say that Shomea KeOneh doesn't work since the Torah wanted each and every person to count. However, the Rashba 1:458 implies that the congregation can fulfill Sefirat HaOmer with Shomea KeOnah. The Beiur Halacha 489 s.v. UMitzvah quotes the Maharitz Geyitz and Orchot Chaim as saying that Shomea KeOnah is effective for Sefirat HaOmer. In conclusion, the Beiur Halacha writes that one should avoid using Shomea KeOnah for Sefirat HaOmer. Nonetheless, Mishna Brurah 489:5 points out that there's no dispute that Shomea KeOnah is effective for the bracha. ↑ Kaf HaChaim 489:28 cites a dispute whether one has fulfilled his obligation and concludes that one should count again without a bracha. The Aruch Hashulchan (O.C. 489:9) assumes that one cannot fulfill the mitzvah through writing. However, R’ Akiva Eiger (Teshuvos 1:29-32) and Chasam Sofer (Teshuvos 6:19) consider the possibility that “Kisiva Kidibur”, writing has the same Halachic status as speaking, and therefore after writing the sefira, a bracha may no longer be recited on a secondary counting. Rav Soloveitchik (Harerei Kedem, 2:110) suggested, that perhaps, even if in other areas of Halacha writing is not equivalent to speaking, sefiras haomer is unique and the mitzvah may be fulfilled with writing. This is because sefira does not require verbalization. Rather, the person must list the correct date in some manner and writing would be sufficient to do so even without articulation. See Birchot_HaTorah#What_Type_of_Learning_Requires_Birchot_HaTorah.3F for a similar discussion. Tosfot (Menachot 66a s.v. zecher) has one opinion who says that one may count sefira during Bein HaShemashot since sefira is only derabbanan. Rosh (Pesachim 10:40) and Tur 489:1 agree. However, the Ran (Pesachim 28a) argues that it’s not proper to enter a safek initially. Similarly, Rambam (Temidin UMusafin 7:22) rules that sefira should be counted at night. Bet Yosef 489:1 quotes this dispute, and his ruling in S”A is unclear. Mishna Brurah 489:14 understands that S”A holds that the halacha follows Tosfot but that it is proper to wait until Tzet Hakochavim. Chazon Ovadyah (p. 232) agrees. After the fact, if one counted during Bein HaShemashot, Magen Avraham 489:6 writes that he has fulfilled his obligation. Beiur HaGra 489:3 and Mishna Brurah 489:15 agree. However, Eliyah Rabba 489:10 argues that one should count again after Tzet Hakochavim without a Bracha. The Avudraham (Tefillot HaPesach) writes that if one prays with an early minyan, he should count without a Bracha, and if he remembers later, he should count with a Bracha. Shulchan Aruch 489:3 codifies this as the halacha. Taz 489:6 and Beiur HaGra 489:3 explain that the case is where the minyan finished during Bein HaShemashot. Mishna Brurah 489:17 writes that if one wants to count after Tzet Hakochavim, he should count with the minyan without a Bracha and have in mind that if he remembers later to count with a Bracha, this original counting shouldn’t fulfill his obligation. Hagahot Rabbi Akiva Eiger 46:16 and Aruch HaShulchan 489:8 agree. Chazon Ovadyah (Yom Tov p. 233-4) adds that the stipulation should be "if I don't remember to count with a bracha then this counting should fulfill my obligation, however, if I remember later then I have intent not to fulfill my obligation with this counting." However, the Taz writes that making such a condition doesn’t work. See, however, the Levush 489:3, who explains that the case is where the minyan finished before sunset, and the reason they counted was for Amei HaAretz who wouldn’t count later at night. S”A 489:1 writes that on the second night of Pesach, one should count sefira after maariv. The Chok Yaakov 489:16 explains that this is based on the halacha of giving precedence to the more common activity (Tadir). However, Mor UKetziah 489:1 argues that Tadir doesn’t apply here since sefira is deoraitta, or at least the mitzvah is explicit in the pasuk even though nowadays it’s derabbanan, while tefillah is entirely derabbanan. Thus, he explains that sefira must be said in the beginning of the night (Tzet Hakochavim) because one shouldn’t delay a mitzvah. Sh”t Igrot Moshe 4:99(1) defends the Chok Yaakov and writes that one must wait to count sefira after maariv even if he prays later in the night. Rav Elyashiv (quoted by Piskei Shemuot p. 18) agrees. On the other hand, Shevet HaLevi 6:53(3) agrees with the Mor UKetziah and says that if one is going to daven in a late minyan, he should count by himself earlier, but he defends the minhag to wait to count with the minyan because otherwise many people would forget to count. Similarly, Halichot Shlomo (Tefilaa 16:16) also writes that the minhag is not to eat from the time of Sefirat HaOmer, and even if one still didn't pray Maariv, one should count the sefira. ↑ Kaf Hachaim 489:80 and Yalkut Yosef 489:25 (Moadim n. 18) write that the minhag is to count the sefirat haomer after Shacharit each day so that if someone forgot to count at night they will have counted during the day and continue the next night. ↑ Teshuvot Vehanhagot 2:247 writes that the Ashkenazi minhag is not to count each day after Shacharit because doing so would be considered baal tosif to validate the day for sefirat haomer which isn't true according to some rishonim. Rivevot Efraim 1:331 writes that in fact this difference of minhagim appears in the Maharshal (end of Bava Kama n. 44) that in Israel they would count after Shacharit each day but in Bavel they wouldn't. ↑ Tur 489:1 writes that if one forgot to count at the beginning of the night one can count all night. Perisha 489:1 quotes the Ran (Pesachim 28a s.v. VeBeHaggadah Gam Ken) who agrees. This is also the opinion of S”A 489:1. ↑ Shulchan Aruch 489:8, Yabia Omer 3:28. Mishna Brurah 489:36-37 explains that we continue counting to satisfy the opinions that say that you can, but don't say a beracha because of the opinions that you cannot, namely the Behag quoted by Tosafot Menachot 66a "zecher" that if you miss one night you can't count any longer because to fulfill the mitzva you need seven full weeks. Tosafot themselves disagree and say you can continue counting, as does Rabbeinu Yitzchak quoted in the Rosh Pesachim 10:41 because the Behag believes that the mitzva is only one long mitzva. Rabbi Joseph B. Soloveitchik quoted by Rav Herschel Schachter in Eretz Hatzvi 3:6-7 explains the behag not as saying that you need seven full weeks, but that you need the 49 consecutive days, and that is why the halacha is that if you count during the day even if you missed it the night before, you can continue through the rest of sefira with a beracha because you accomplished this obligation of consecutive nights. Sh"t Beit Halevi 1:39 says that since there is a mitzva to count days and weeks, if somebody misses a night in the middle of the week, he can count with a beracha on the nights that complete the week. Shearim mitzuyanim Bihalacha 120:4 says that nowadays when people miss a night they think they are exempt, and that is not what the Shulchan Aruch intended by saying that one should count without a beracha, and therefore, nowadays one should continue counting with a beracha. ↑ Pri Chadash 489:8 quotes one Rabbi who said that just like the Shaliach Tzibbur can make the brachot of chazarat hashatz even if no one in the congregation needs those brachot to fulfill an obligation, so too a Shaliach Tzibbur may make tha bracha of Sefirat HaOmer even if he isn't obligated in that bracha because he missed a day. However, the Pri Chadash argues that once he missed a day he isn't considered mechuyachav in the mitzvah of sefiarh according to that opinion that one may not miss any days. He compares it to the Yerushalmi which says that a person who lives in a city that reads the megillah on the 14th can't fulfill the obligation of a person who lives in a walled city who reads the megillah on the 15th. He argues that even Rashi (Megillah 2a) who seems to argue on the Yerushalmi, doesn't really disagree (see also Tosfot Yevamot 14a s.v. Ki). ↑ Sh"t Maharash HaLevi Siman 5 (see it inside) argues at length that the mitzvah includes an element of counting the days and an element of counting weeks and if one lacks either one the obligation wasn't fulfilled and one should repeat it with a Bracha. The Mishna Brurah 489:22 (and Shaar HaTziyun 489:28) hold like the Eliyah Rabba who also holds that if one didn't count the weeks one must repeat the counting with a Bracha. ↑ The Pri HaAretz Siman 10 quotes the Mahari Malcho who says that if on the 39th day one said that tonight is 40 minus 1 one fulfilled one’s obligation. This is also quoted by the Kemach Solet pg 118b s.v. Mi SheShachach, Bear Hetiev 489:8, Yad Aharon (on the Tur Siman 489 s.v. Im Amar). Rama 489:4 writes that from the time of sefira, it is forbidden to eat until one counts. Mishna Brurah 489:23 writes that really the prohibition begins from a half hour before Tzet Hakochavim, while the S”A HaRav 489:17 and Kaf HaChaim 489:64 hold that the prohibition begins from a half hour before sunset. Kaf HaChaim 489:66 clarifies that it is forbidden only to eat a meal that fits the criteria given by S”A 232:3, meaning more than a KeBeitzah of bread; fruit, even in large quantities, is not considered a meal. Yalkut Yosef 489:43 and Hilchot Chag BeChag (p. 16) write that Pat HaBah Bekisnin is the same as bread for this halacha; Nitei Gavriel 26:5 disagrees. Sh”t Igrot Moshe 4:99 writes that the logic permitting a person to eat before maariv - namely, that if one usually prays in a minyan he won’t forget to pray - should also permit eating before sefira, even after Tzet Hakochavim. Az Nidbaru 6:52, Rav Elyashiv (quoted by Piskei Shemuot p. 47), and Nitei Gavriel 26:4 agree. See Aruch HaShulchan 232:16, who records this leniency regarding mincha. ↑ Regarding Shacharit, Rashi Brachot 5b understands that Abba Binyamin wouldn’t learn before Davening, however, Tosfot disagrees. Rosh 1:7 explains that Rashi meant only that a person who doesn’t usually pray with a minyan shouldn’t learn before praying. Someone who usually prays with a minyan, on the other hand, is unlikely to forget to pray and thus may learn before praying. Tur and S”A 89:6 codify the Rosh as halacha. Mishna Brurah 232:11 writes that the same is true of mincha. Therefore, when Mishna Brurah 489:24 writes that doing any activity before counting sefira is the same as by mincha, he means that it’s permitted if one usually davens with a minyan. ↑ Rambam (Temidin UMusafin 7:24, Sefer Hamitzvot #161) rules that women are exempt from counting Sefirah. This is brought in Bet Yosef 489:1 s.v. VeTzarich and is also the opinion of Magen Avraham 489:1 (who also quotes Zohar Titzaveh pg 319 to show women are exempt) and Mishna Brurah 489:3. Interestingly, Ramban (Kiddushin 34a) holds that women are obligated because it is a Mitzvat Aseh She'ein HaZman Grama. Many Acharonim grapple with this Ramban, as, seemingly, it's indeed time bound between Pesach and Shavuot. The Avnei Nezer (O.C. 384) postulates that since the Torah ties Sefirat HaOmer to the day after Yom Tov, and not Yom Tov itself, it's not really dependent on the 16th of Nissan, but the day before, and, therefore, SheHaZman Grama. In opposition, the Sridei Esh (vol. 2 Siman 116) argues that Zeman Grama means there is a specific interval of time in which one must fulfill the Mitzvah. Sefirat HaOmer isn't bound to a time interval, however, it itself is a time interval, in which we are obligated to acknowledge during each of its days. Rav Yosef Dov Soloveitchic (Nefesh HaRav pg. 191, see also MiPininei HaRav pg. 124) and the editors of the Rambam Frankel (Sefer HaMitzvot ibid.) felt it was just a copyist error, as none of the Ramban's major Talmidim who usually quote his opinions cite it. Rav Hershel Schachter and Rav Asher Weiss point out how a recent discovery of the Sefer Imrei Shefer, Chiddushim of the son of the Maharam Chalawa, who was a Talmid of a Talmid of the Rashba, shed light on the matter. The son quotes his father, the Maharam Chalawah, who explains that Sefirah isn’t Zman Grama since the time doesn’t cause Sefirah, but the Korban HaOmer, just like Birkat HaMazon on Shabbat isn't Zeman Grama, as the Mitzvah of Seudat Shabbat is Gorem it. Rav Schachter felt that the Maharam Chalawah's explanation was most relevant, as it was coming from a Talmid from the same Beit Midrash who most probably had a masorah. For a more detailed discussion, see the above article by HaRav Asher Weiss, Biur Sefer HaMitzvot LeRav Saadia Gaon by Rav Yerucham Fischel Perlow (Mevo chapter 12, specifically s.v. veOmnam), and the essay by HaRav Shlomo Wahrman, Rosh Yeshiva of HANC, in Orot HaPesach, pg. 289. Shulchan Shlomo 489:3 writes that women shouldn't count sefirat haomer with a bracha because they might forget to count one night and they won't know the halacha (that they're supposed to continue without a bracha). ↑ Shaarei Teshuvah O.C. 489:20, Aruch HaShulchan O.C. 489:15, Sheilot U'teshuvot Kesav Sofer 99, Sheilot U'teshuvot Maharam Shick 260, and Sheilot U'Teshuvot Mishnah Halachos 11:398. Rabbi Yosef Dov Soloveitchik quoted in Eretz Hatzvi 3:6-7 says that according to the Behag quoted in Tosafot 66a "zecher" the bar-mitzva boy should be allowed to continue with a beracha because the mitzva is dependent on the consecutiveness of the 49 nights, which he fulfills even before becoming of age. ↑ Shulchan Aruch OC 489:5 writes that if one said the bracha with in mind that one will say the Hayom that his friend says, he fulfills his obligation. Yet, Taz 489:8 writes that implied from S”A is that Lechatchila one should say the bracha only when you know the number of the day. Mishna Brurah 489:29 adds that Lechatchila it’s forbidden to pause for more than Toch Kedi Dibbur. ↑ Sh”t Rashba 1:457 brought in Bet Yosef 489 s.v. Katav rules that really to fulfill the mitzvah it doesn’t matter whether you mention the Omer or not, however, it’s preferable to mention the Omer to clarify. This is also the opinion of the Mishna Brurah 489:8. ↑ Magen Avraham 489:5 writes that one should count the tens digit before the ones digit since that is the normal way to count and the Gemara Yoma 55a writes that when counting numbers we should follow the practice of the place. Chok Yakov 489:10 agrees. Emunat Shmuel responsa 49 writes that the sefira is counted with the ones digit first because we follow Rabbi Yehuda in Yoma 55a and he doesn't say that it depends on the place. ↑ Magen Avraham 489:5, Otzar Hamoadim 489:8. The Get Pashut 126:24 is bothered that the minhag is to say on Yom Kippur the text of Achat V'shatim mentioning the smaller number before the bigger one and for Gittin the minhag is to write the bigger number first (Rama EH 126:5). This is cited by the Mitzvat Sefirat Haomer p. 75. ↑ Chok Yakov 489:10 writes that this is the regular form of terms in Hebrew. Rav Soloveitchik (Halakhic Positions of Rav Joseph B. Soloveitchik) said that the word “Ba’Omer” reflects the connotation that Sefirah is diorayta even today, in accordance with the Rambam, and the present period is thus even today called the Omer period. However, “La’Omer” implies that the counting is from the time of the korban haomer, which does not apply nowadays, and thus the counting is only rabbinic. see however, Hilchot Chag Bechag pg. 33 who says exactly the opposite. ↑ Tur 489:6 quotes the Avi Ezri that writes that a person who had in mind the wrong number during the beginning of the bracha and during the end of the bracha he thought of the correct number and said the HaYom correctly, isn’t Yotzei as he needs the beginning and end of the bracha to be with the correct intention. Bet Yosef 489:6 quotes the Mordechai that this Avi Ezri is going according to the opinion that Sefira is Deoritta and therefore since it’s a Safek whether such a Bracha is sufficient (as in Brachot 12a) he must make a new bracha. However, Bet Yosef concludes since majority of RIshonim hold Sefira is Derabbanan, we are lenient on this safek and is Yotzei. This is also the opinion of the S”A 489:6 and all achronim agree including Mishna Brurah 489:32. ↑ (1) Tur 489:6 quotes the Avi Ezri that writes that a person who had in mind the correct number during the beginning of the bracha and during the end of the bracha he thought of the wrong number and said the wrong HaYom, isn’t Yotzei as he needs the beginning and end of the bracha to be with the correct intention. (2) Bet Yosef 489:6 quotes the Mordechai that this Avi Ezri is going according to the opinion that Sefira is Deoritta and therefore since it’s a Safek whether such a Bracha is sufficient (as in Brachot 12a) he must make a new bracha. However, Bet Yosef concludes since majority of Rishonim hold Sefira is Derabbanan, we are lenient on this safek and is Yotzei. So rules the S”A 489:6 and some achronim agree including Magen Avraham 489:12, Olot Shabbat 489:6, Chok Yakov 489:19, and Kaf HaChaim 489:75. Yalkut Yosef (Moadim edition 5764 pg 615) writes that one should count again to fulfill the obligation according to everyone however one shouldn’t make a Bracha like S”A. (3) However, Bach (489 s.v. UMah SheKatav Katav Od Avi Ezri) argues on the Bet Yosef and says that according to everyone one isn’t Yotzei in such a case as the counting was simply wrong. This is also the opinion of the Levush, Pri Chadash and Mishna Brurah 489:32. (4) The third approach is that of the Maamer Mordechai 489:8 and Chok Yosef who explains S”A as where one corrected himself within Toch Kedi Dibbur. (5) Another explanation of S”A is that of the Taz 489:9 (to defend S”A against his father-in-law the Bach) who explains that the S”A was only dealing with someone who made the bracha with the wrong intent either in the beginning or in the end and then counted the Hayom correctly and so one fulfills his obligation according to the majority of Rishonim that Sefirah is Derabbanan. ↑ Tur and Shulchan Aruch 493:1 based on gemara in Yevamot 62b. ↑ The source for this minhag is the Teshuvah of R. Yehoshua Ibn Shuib (cited by Bet Yosef 493:2) which says that the students of Rabbi Akiva died during the Omer except for the last 15 days which leaves the first 34 days, however, based on Miksat HaYom KeKulo (a minority of the day is considered like a whole day) one may stop mourning on the morning of the 34th. This is the ruling of S”A 493:2 and the practice of Sephardim as recorded in Yalkut Yosef (Kitzur S”A 493:1), Yabia Omer 3:26, Yechave s.v. Nohagin, Beiur Halacha 493 Daat 4:32. This is explained clearly in Biur HaGra 493:6 s.v. Yesh Nohagim, and Rabbi Flug's article on Sefirat HaOmer. ↑ The source for this minhag is the Rama 493:2 who holds that the students of Rabbi Akiva stopped dying on the 33rd day of the Omer and by the principle of Miksat HaYom KeKulo (a minority of the day is considered like a whole day) one may stop mourning on the morning of the 33rd. This is the explanation of the Biur HaGra 493:9 s.v. UMarbim, and the practice of Ashkenazim as recorded by Halachically Speaking (Volume 3, Issue 8, page 3). This is explained clearly in Beiur Halacha 493 s.v. Yesh Nohagim and Rabbi Flug's article on Sefirat HaOmer. ↑ Bet Yosef 493:3 quotes the Ri Ibn Shoiv who records another tradition that Rabbi Akiva’s students only died on the 33 days during the Sefira when we do say Tachanun, excluding the 7 days of Pesach, 7 Shabbatot, and 2 days of Rosh Chodesh Iyar. The Bach 4931 clarifies that really we include the one day of Rosh Chodesh Sivan and exclude one day of Pesach since the last 7 days of Pesach certainly already includes Shabbat. Therefore, there are 16 days when Rabbi Akiva's students didn't die. Based on this tradition, Sh"t Igrot Moshe 1:159 writes, there is a minhag to mourn for 33 non-consecutive days during the sefira. ↑ Sh”t Igrot Moshe 1:159 explains that the reason for this minhag is that it holds that the students of Rabbi Akiva died on all the days between Pesach and Shavuot except for the 16 days when one can not say Tachanun (7 days of Pesach, 6 Shabbatot, 3 days of Rosh Chodesh) and so the minhag forbids getting married and cutting hair the entire Sefira except for Rosh Chodesh Iyar and Sivan (and Pesach and Shabbat are already forbidden to get married). ↑ Yalkut Yosef (Moadim pg 428). The source for this minhag is the Teshuvah of R. Yehoshua Ibn Shuib (cited by Bet Yosef 493:2) which says that the students of Rabbi Akiva died during the Omer except for the last 15 days which leaves the first 34 days. Based on Miksat HaYom KeKulo (a minority of the day is considered like a whole day) one may stop mourning on the morning of the 34th. This is the ruling of S”A 493:2 and the practice of Sephardim as recorded in Yalkut Yosef (Kitzur S”A 493:1) and Yabia Omer 3:26. ↑ Rama 493:1, See Nisuin Kehilchatam 5:19 for lengthier discussion. ↑ Rav Moshe Feinstein (Igros Moshe OC 2:95) held that it is not permissible to take a haircut or shave, since that does not directly contribute to the joy of the chosson and kallah. The Gemara Yevamot 62b records the tragic story of Rabbi Akiva’s student passing away between Pesach and Shavuot. The Tur 493:1 records the minhag not to take hair cuts during sefirat HaOmer in order to mourn the death of Rabbi Akiva’s students. The Tur writes that some would cut their hair from Lag BaOmer and on because there’s a tradition that the students of Rabbi Akiva stopped dying on Lag BaOmer. The Tashbetz 1:178, however, says that they died until 15 days before Shavuot (Pros HaAseret), which is the 34th of the Omer. S”A 493:2 follows the Tashbetz, while the Rama quotes some who follow the Tur and some who don’t take a hair cut from Rosh Chodesh Iyar until Shavuot. Bet Yosef 493:3 quotes the Ri Ibn Shoiv who records another tradition that Rabbi Akiva’s students only died on the 33 days during the Sefira when there’s no Tachanun. According to this tradition, Beiur Halacha 493 s.v. 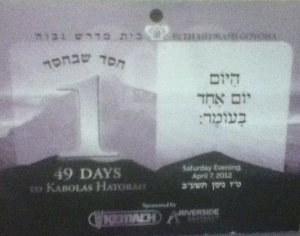 Yesh the minhag developed to mourn 33 days during the sefira corresponding to the days they died. Kitzur S”A 120:6-7 writes that some mourn the last 33 days of sefira starting after Rosh Chodesh Iyar excluding Lag BaOmer and a variant minhag is to mourn from the first day of Rosh Chodesh Iyar until the Shelosha Yemei Hagbala excluding Lag BaOmer. S”A 493:2 writes that the minhag is to mourn from the beginning of the sefira until the morning of the 34th of the Omer. Kaf HaChaim 493:12 and Chazon Ovadyah (pg 253) agree that this is the common minhag among Sephardim. Yalkut Yosef (Moadim pg 430) and Maamer Mordechai of Rav Mordechai Eliyahu (Sefirat HaOmer #48) agree. Kaf HaChaim 493:12-3 adds that some follow the Arizal’s practice not to cut one’s hair the entire Sefira. Although the Mishna Brurah 493:15 records the Ashkenazic minhag to mourn from the first day of Rosh Chodesh Iyar until the Shelosha Yemei Hagbala, Peninei Halacha (Hilchot Sefirat HaOmer) writes that nowadays the common Ashkenazic minhag is like the Rama to mourn from the beginning of the Omer until Lag BaOmer in the morning. Mishna Brurah 493:6 explains S”A as saying that one may only cut one’s hair starting from the 34th in the morning because Miksat HaYom KeKulo only operates starting in the daytime. In 493:10 he writes that the same for the Rama regarding the 33rd. However, Mishna Brurah 493:11 quotes some achronim who argue that one may even cut one’s hair from the nighttime. Rav Shlomo Zalman (cited by Halichot Shlomo p 364, note 80) once permitted taking a hair cut on Lag BeOmer at night. ↑ Sh"t Igrot Moshe YD 2:137. See Halachically Speaking article on Sefirah. See Nitei Gavriel (Pesach 49:11) who writes that the minhag not to cut one's hair during sefirah also applies to women. ↑ Bein Pesach Lishavuot page 241 quoting Rav Shlomo Zalman Auerbach and Rav Shmuel Wosner. ↑ Tur 493 says that some have the custom "lo lihistaper." Masekhet Semachot (7:11) in regards to mourning writes that lihistaper means to cutting the hair of one's head, mustache, beard, and all other hair. Nitei Gavriel (Pesach vol 3, 49:2) and Chazon Ovadyah (p. 262) write that including in the minhag not to take a hair cut is not to shave. ↑ Rav Soloveitchik (cited by Rav Schachter in Nefesh HaRav pg 191-2) compared the Sefira to the 12 months of mourning in which a person who shaves daily may shave after waiting a few days. Rav Soloveitchik felt that this was the case because all customs have to be based on some opinion or patterned after another halacha. Therefore, he argues that the mourning of the Omer is parallel to the mourning during the year of mourning for a parent. Therefore since the halacha says that it is permissible to shave during the year once one's friends scold him to tell him that his hair is too long ("ad she-yig'aru bo chaveirav": Moed Katan 22b, Rambam Hilkhot Evel 6:3), it would be permissible during the omer also. Rav Schachter (“Hilchos Chol HaMoed”, min 67-70) clarified that not shaving for 3 or 5 days is sufficient. Rabbi Willig (“Hilchos Pesach and Sefira#1”, min 85-90) also quotes Rav Soloveitchik. Rav Aharon Lictenstein vbm.org says that it is even an obligation to shave for kavod shabbat on Friday incorporating Rav Soloveitchik's approach. The Bet Yosef 493:3 writes that those who cut their hair on Rosh Chodesh Iyar because they consider it a Yom Tov are mistaken because the minhag is not to cut their hair on Rosh Chodesh Iyar. He adds that they may have mistakenly thought it was permitted based on another minhag which would mourn another 33 days during the sefira. Similarly, Mishna Brurah 493:14 summarizes that according to those who don’t cut their hair the first 33 days of the Sefira, it would be contradictory to shave on Rosh Chodesh Iyar. However, the Radvaz 2:687 permits cutting one’s hair on Rosh Chodesh Iyar if not cutting one’s hair causes one’s pain based on the halacha that one who is pain is exempt from the mitzvah of Sukkah. Sh”t Chazon Ovadyah (vol 1, pg 55) clarifies that although the halacha of Sukkah is based on Teshvu Kein Taduro, the Radvaz means that it’s logical that one can be lenient if it’s bothersome since sefira is only a minhag. Chida in Yosef Ometz 40:2 and Kaf HaChaim 493:40 write that some rely on this Radvaz. Similarly, Rav Ovadyah in Yalkut Yosef (Moadim pg 431) and Chazon Ovadyah (pg 262) writes that one should be careful not to shave during sefira and if it’s difficult not to shave, one may shave on Rosh Chodesh Iyar. The Bach 493 quotes the Minhagim who says that it’s permitted to get married on Rosh Chodesh Iyar if it falls out on Shabbat and explains that it’s based on the fact that there’s a combination of the kedusha of rosh chodesh and kedusha of Shabbat to override mourning of Sefira. Pri Megadim (E”A 493:2) clarifies that the Bach means getting married on Friday because it’s forbidden to get married on Shabbat. Regarding this Bach, the Pri Chadash 493:3 writes that the same is true for haircuts. Thus, Mishna Brurah 493:5 writes that if Rosh Chodesh Iyar falls out on Shabbat one may cut one’s hair on Friday. Kitzur S”A 120:6 and S”A HaRav 493:8 agree. It seems clear from the above achronim that Rosh Chodesh alone isn’t sufficient to permit cutting one’s hair. However, Rav Lichtenstein (vbm.org) ruled that not only is it permitted but an obligation to shave for kavod Shabbat during sefira just like Kavod Shabbat theoretically overrides the nine days (see Mishna Brurah 551:32). Similarly, Rav Ovadyah in Chazon Ovadyah (Yom Tov pg 262) and Yalkut Yosef (Moadim pg 431) writes that if there is a great need one may shave every Friday. Kaf Hachaim 493:17 and Nitai Gavriel (Pesach v. 3, 49:7) write that if one gets headaches from not shaving one may shave every Friday. ↑ Rabbi Eliezer Melamed (Peninei Halacha "Yom HaAtzmaut") writes that those who shave regularly should shave prior Yom HaAtzmaut in order to look presentable for the holiday. He also quotes Rav Yitzchak Nissim and Rav Tzvi Yehuda HaCohen Kook who agreed. Shana Beshana (5752, p. 145) quotes Rav Tzvi Pesach Frank as agreeing. Shana B’shana (5752, p. 145) quotes Rav Tzvi Pesach Frank as agreeing. Rav Shaul Yisraeli in Mareh HaBezek 4:54 permits shaving from after midday prior to Yom HaAtzmaut even for those living outside Israel. However, Yaskil Avdi 6:10 and Rav Soloveitchik (quoted by Rav Schachter in Nefesh HaRav p. 94) argue. Rav Moshe in Igrot Moshe 4:102 rules that if one will lose money by not shaving, one may shave during sefira, because the minhag never applied in a case of monetary loss. In 5:24(9), he explains his position and says that only a person who is concerned about losing his income for the duration of the sefira is permitted to shave. If, however, he can simply borrow money and then repay it with later income, this leniency wouldn’t apply. See Maadanei Shlomo (p. 54) who quotes Rav Shlomo Zalman as also being lenient. Similarly, Sh”t Zera Emet 69 writes that for parnasa it is permitted, but each case should be judged independently. Chida in Machzik Bracha 493:4, Kaf Hachaim 493:19, Sh”t Yaskil Avdi 6:5, and Nitei Gavriel (49:8) agree. However, Piskei Shemuot (p. 62) quotes Rav Elyashiv saying that nowadays it is forbidden to shave for parnasa because it’s not considered strange to go unshaven. ↑ Mishna Brurah 493:2. The minhag not to is quoted in the Eliyahu Zuta 493:1 quoting Rabbeinu Yerucham and Leket Yosher page 97 quoting the Terumat Hadeshen. ↑ Yalkut Yosef (Moadim pg 433). ↑ The Mishna Berura (493:2) writes that it is permissible to recite the bracha of shehechiyanu during sefira.Thus, Rav Moshe Feinstein (Mesoras Moshe, p. 156), Rav Yaakov Kamenetzky (Emes L’Yaakov O.C. 493), Rav Shlomo Zalman Auerbach (Halichos Shlomo, Sefiras Haomer 11:53, Shalmei Moed pg. 441 and Aleihu Lo Yibol 286), and Rav Yosef Shalom Elyashiv (Ashrei HaIsh, Moadim 65:12) rule that it is completely permissible to buy new clothing if it is not your minhag not to. See Taamei Haminhagim page 251. ↑ Piskei Teshuvot 493: note 6 quoting the Satmar Rebbe, Mevakshei Torah 19 quoting Rav Elyashiv, Tzitz Eliezer 11:41. Piskei Teshuvot 493:1 quotes several poskim who bring down this minhag. ↑ Yechave Daat 3:30, Tzitz Eliezer 11:41. Piskei Teshuvot 493:1 quotes several poskim who bring this minhag as well. ↑ Iggerot Moshe OC 1:166, YD 2:137, Minhag Yisrael Torah 493:8, Aruch Hashulchan 493:2, Yechave Daat 3:30 based on a Magen Avraham 493:1 that prohibits dancing during sefira because the two come together. Mishneh Halachot 8:118, Yachava Daat 6:34, Rav Mordechai Eliyahu (Maamar Mordechai 20:40), and Hilchot Chag BeChag (p. 67) agree that during sefirat ha’omer, it is forbidden to listen to musical instruments. Kapei Aharon 52 contends that although listening to music certainly is forbidden during sefirat ha’omer, the three weeks, and the 12 months of mourning for a parent, it was never mentioned by Shulchan Aruch or the commentaries because it is forbidden to listen to music all year round. Minchat Yitzchak 1:111 adds that even if there is no proof for this ruling, the minhag is to be strict. Rav Mordechai Willig quoted by Rabbi Aryeh Lebowitz says that music is not necessarily forbidden, the prohibition was only placed on things that lead to excessive joy, which music doesn't necessarily accomplish. Similarly, Rabbi Jachter (Gray Matter vol 3 p. 5) quotes Rav Aharon Lichtenstein, who in turn cited Rav Soloveitchik as saying that music wasn’t prohibited at all during sefirat ha’omer or the three weeks, but most poskim do not accept this position. ↑ Az Nidberu 8:58, Iggerot Moshe OC 1:166, Sh"t Yechave Daat 6:34, Tzitz Eliezer 15:33, Yalkut Yosef Moadim page 434, Maamar Mordechai of Rav Mordechai Eliyahu Sefirat Haomer #40. Chelkat Yaakov 1:62 argues that a device which didn't exist at the time of the decree cannot be included. In his article at  Rabbi Aryeh Lebowitz says that this argument can only be made for music in general, but during sefira this would not apply because there was never a formal ban placed on music specifically during sefira. See http://halachipedia.com/index.php?title=Listening_to_Music for the discussion about music during the year. ↑ * see matzav.com that Rav Yisrael Belsky (see also Shulchan Halevi 13:6 of Rav Belsky) and Rav Shlomo Miller differentiate between different types of a cappella, only permitting choirs which simply sound like a group of people singing and nothing more. Rav Binyamin Zilber in Az Nidberu 8:58 discussing music during the year says that a recorded voice is considered like an instrument. Sh”t Shevet HaLevi 2:57 and 8:128, however, considers recorded vocal music like a musical instrument, which he says is forbidden all year round. Additionally, Sh”t Tzitz Eliezer 15:33 writes that even though he considers recorded vocal music like vocal music, it is forbidden during the three weeks and sefirat ha’omer based on the minhag not to dance. Nitei Gavriel 15:1 agrees. ↑ Rabbi Aryeh Lebowitz quotes Sefer Eleh Heim Moadai quoting Rav Chaim Pinchas Scheinberg and Rav Eliyahu Schlesinger. ↑ Hilchot Chag B’chag p.63, Halichot Shlomo, Moadim 2:11:14. ↑ Iggerot Moshe OC 3:87.